The increasing complexity of environmental problems were caused by human behavior. It was characterized by river pollution, industrial waste pollution, and the transition of green land to commercial land. Hence, to minimize the problem of environmental damage must be done early. 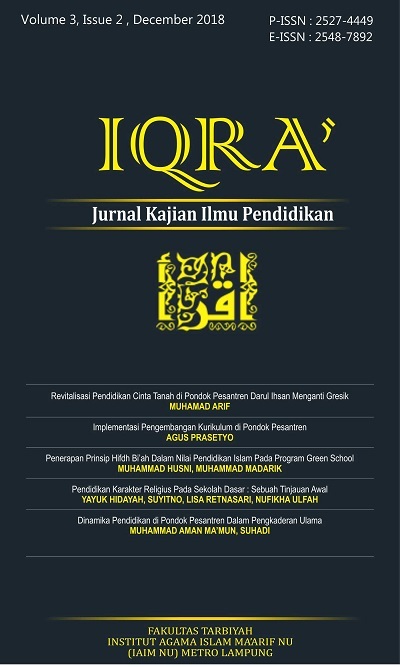 The aim of this study was to explain the Concept of Green School Program in MAN 1 Malang and to know the value of Islamic education which is the basis of the implementation of Hifdh Bi'ah principle of program Green School in MAN 1 Malang. This research was descriptive qualitative through maqÄshid al-syarÄ«yarah approach. The data collected through primary and secondary data. The results showed that a concept of Green School program with a participatory and sustainable principle. The application of the basic values â€‹â€‹of Islamic education was applied in 5S culture (Smiles, Greetings, Greetings, Courteous, Courteous and 7K (Hygiene, Beauty, Comfort, Orderliness, Shadiness, Familiarity, Security). Key words: Implementation Hifdh Bi'ah, The Value of Islamic Education.